Buy Kentucky Derby Tickets for the 2019 Kentucky Derby and the Kentucky Oaks. The 2019 Kentucky Derby will take place at Churchill Downs in Louisville, Kentucky. Tickets to the Derby are some of the most coveted in all of horse racing. Seating is available throughout the Churchill Downs track. Whether you want to sit in the Grandstands or Millionaire's Row, Sports Traveler has your 2019 Kentucky Derby tickets. Where to sit at Churchill Downs during the Kentucky Derby? 1st Floor Grandstand: Travelers can expect to have clear views of the front stretch of Churchill Downs, however will not be able to see the entire track. This ticket is an excellent choice for travelers on a budget. 2nd Floor Grandstand: For the Kentucky Derby traveler who is on a budget, but wants elevated seating, a 2nd Floor Grandstand ticket is for you. Have a great view of the front stretch and a better view of the entire track. See the Kentucky Derby at an inexpensive price. 3rd Floor Grandstand: 3rd Floor Grandstand or Clubhouse Tickets provide an excellent view of the entire track for your enjoyment of the entire race. Some higher rows are covered by an overhang roof. 4th, 5th, 6th Floor Millionaires Row: Enjoy luxury Kentucky Derby tickets with premium seating on the 4th, 5th, or 6th Floor Millionaire's Row, the most exclusive at Churchill Downs. Fantastic views of the entire track plus exclusive VIP treatment! All tickets are at reserved tables. Step onto the balcony to view the races. 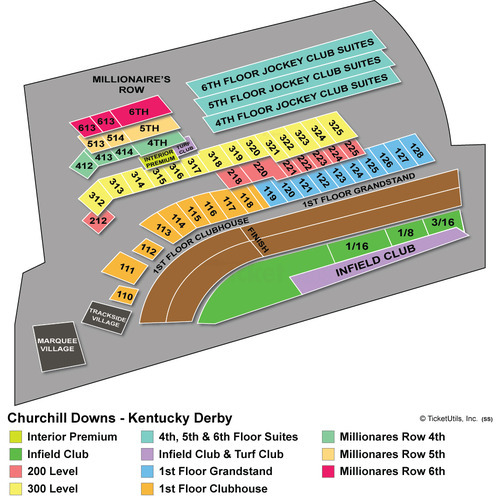 These tickets are General Admission (GA) for the Churchill Downs Infield and do not include a seat in the stands. They are open seating on the infield grass. You can bring your own portal chair and/or blanket to sit on. See the Churchill Downs website for complete rules and restrictions.